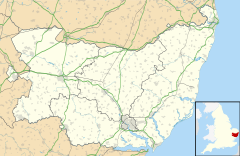 Wordwell is a small village and civil parish in Suffolk, England, about five miles North of Bury St Edmunds. The village was hit by the Black Death in 1348 and never recovered in terms of population; in 2005 it was estimated to have only 20 residents. During the 19th and early 20th centuries it was part of the Culford Estate. All Saints Church is largely Norman but with Victorian alterations. Wordwell is also one of very few Thankful Villages, that is to say one which lost no men during either World Wars. The church has carvings on benches and in stone. A mass grave, probably from the time of the Black Death, was found when electricity was provided to the church. Google Earth shows the outlines of buildings that once stood on the other side of the road.